In this issue, Gwen faces the terrors of Date Night with Harry and heroing for hire. The long-term antagonists introduced in the last issue are nowhere to be seen; this one relies on the ongoing mystery of Gwen's headaches and the subtle, strange behaviour of her symbiote to scratch the strategic plotting itch. Our destination may not be clear, but the ride remains thoroughly enjoyable. Takeshi Miyazawa and Ian Herring deliver another strong serving of adventurous visuals. The perspectives chosen for blocking out the panels are still acrobatic and inventive, if not quite as memorable as those in #6. The facial work on the characters is also powerfully expressive - Mr. Miyazawa makes an extra effort, given that his protagonist is so often hidden behind a mask, to make Gwen memorable when she takes it off. Ian Herring's colours are bold; his palette respects the high-intensity mood of Earth-65 while also harmonizing with the realistic look of the art. The stronger colours also serve as a useful reminder that, despite the art team and the strongly introspective narration Gwen does now, this volume isn't quite "Ms. Marvel: Spider Edition." And even where it is similar to that title, delivering the same level of insight and lovability as G. Willow Wilson's Ms. Marvel is no small achievement. Thanks to Gwen's date(s) with Harry, this issue's script delivers another dose of wonderfully snappy dialogue. It's already becoming a distinctive fingerprint for this volume, and it's one that's worth looking forward to. On the more strategic scripting level, this issue is clear about its theme. This story is about how Gwen grows into her role as a public hero while struggling to hold onto her everyday life at the same time. It's fertile ground for a spider-story, rarely planted by other spiders and currently wide open for Gwen. Gwen gets a nice action set-piece when she has to rescue a few folks from a potentially-lethal accident. It's retail, meat-and-potatoes heroing, told very well. This, too, is becoming a welcome fingerprint for this title. There's very little to complain about here. While the comic isn't flawless - so few comics are - its lapses are minor and easily forgivable, particularly if you've already fallen in love with the protagonist. 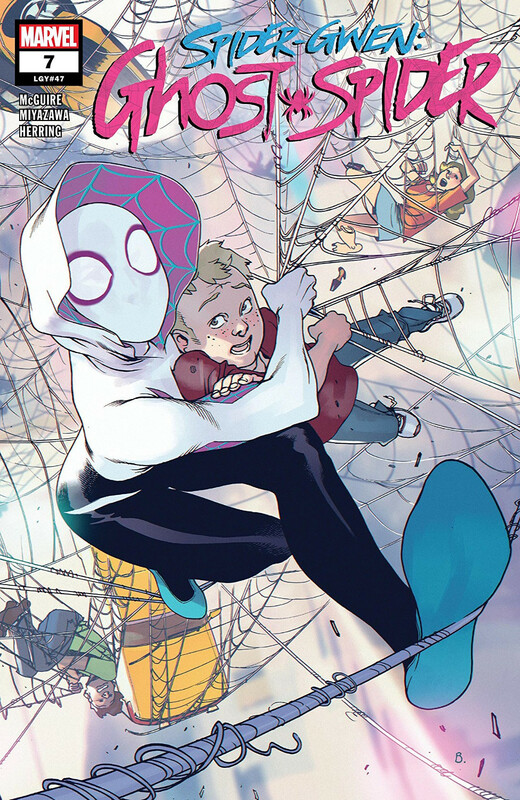 The slow pace with which this arc is unfolding might be a problem if the only way to get into Spider-Gwen was to have your socks knocked off by a single issue. Like a lot of Marvel's contemporary titles, though, this one seems crafted for a larger stage. It will surely turn into a satisfying trade when this arc is completed and collected, and that might be its most popular and effective format for snaring new readers. Spider-Gwen #7 sees its protagonist seesawing again between hero and ordinary person. This is a somewhat "quiet" issue, lacking a blockbuster triumph or a shocking revelation. But it builds up Gwen's story in a way fans will find thoroughly satisfying. The words and art are entertaining, and more importantly, they're revealing and completely believable. This issue is subtle but deeply committed with its fall-in-love moments, like the little panel inserted so that Gwen can pet a stray cat.